Heat oven to 350°F. Spray 13x9-inch (3-quart) baking dish with cooking spray. Meanwhile, in large microwavable bowl, microwave cream cheese and powdered sugar uncovered on High 1 minute, stirring every 30 seconds, until softened. Stir until smooth, then slowly stir in milk. Stir in lemon peel. Separate dough into 5 rolls; return icing to refrigerator. 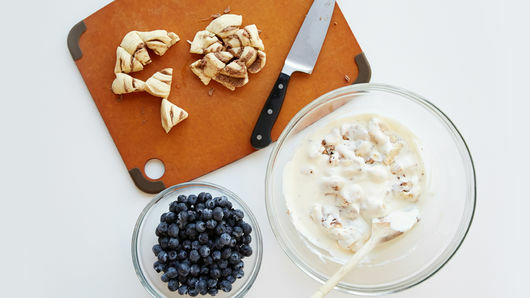 Cut each cinnamon roll into 6 pieces, and stir into cream cheese mixture. 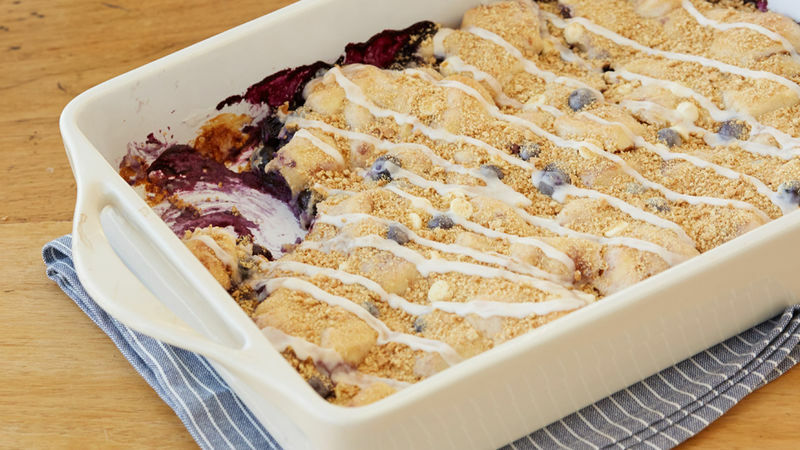 Fold in berries; spoon into baking dish. Top with white vanilla baking chips. Bake 26 to 29 minutes or until bubbling around edges and dough is baked through. Let stand 10 minutes. Top with crushed graham crackers. 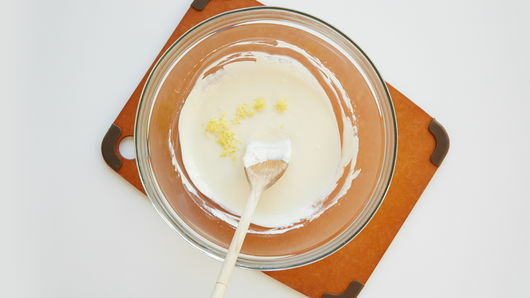 Place icing in small bowl; microwave uncovered on High about 10 seconds or until thin enough to drizzle. Drizzle on top with spoon. Serve warm. Frozen berries also work in this recipe. Substitute 2 cups frozen blueberries during the off season. Be sure to add them frozen to avoid color bleeding. Bake time is the same as with fresh. Fresh raspberries are great in this recipe as well. 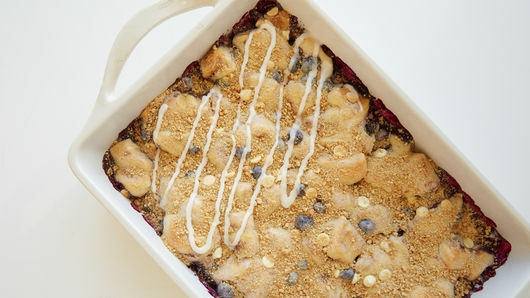 Substitute 1 cup raspberries for half of the blueberries to turn this into a mixed berry bubble-up bake.